A cruise will be the most breathtaking vacation you’ll ever take. You only have to unpack once before eating and drinking your way around exotic ports of call. However, there are still a few things you need to know before crossing the gangway and letting your hair down. Here are nine first-time cruise tips. Unless you’re in a loft, your stateroom will be nothing like a hotel room at the Hilton – or even the Holiday Inn for that matter. Most staterooms are around 180 square feet, while still providing plenty of room for storage and sleep. if you’re a couple traveling together, you’ll be fine. If you’re a family of five in an interior stateroom – good luck! Don’t be fooled by the server holding drinks when you step into the atrium of your cruise. Most drinks come with a price tag and aren’t complimentary. As soon as you take that tiny-umbrella-topped daiquiri, be prepared to hand over your sail card. Keep your phone off unless you know what you’re doing. My first cruise, with my iPhone, cost me over $500 in data charges. My phone was checking my email and burning through data at $20 per meg. It adds up. Just because you can use your phone, doesn’t mean you have to. Be prepared to eat. In fact, if you want to eat your way through the ship, go ahead and do that too. There are so many free dining options onboard. If you are feeling fancy, treat yourself to one of the specialty restaurants onboard – in some cases, these far exceed land-based restaurants. Just because the captain is the designated driver (or navigator) doesn’t mean you have to go all out. Pace yourself, especially on the first night. If you decide to splurge, make sure you stay hydrated. Too much sun and “fun” can ruin your cruise. Look closely at those people that set their belongings on a lounger by the pool at sunrise. Don’t be one of them. In fact, if you see unattended items, tell someone. That’s what you’d do in an airport, right? When you leave the ship and hear the captain announce, “All aboard time is at 5:30,” you want to be back by 5:30 – but preferably much earlier than that. The ship won’t wait for you. You don’t want to be left in a cruise port with only the shirt on your back and the bottle of rum you had to have. But hey, at least you’ll have had a good time. Safety drills are taken very seriously. 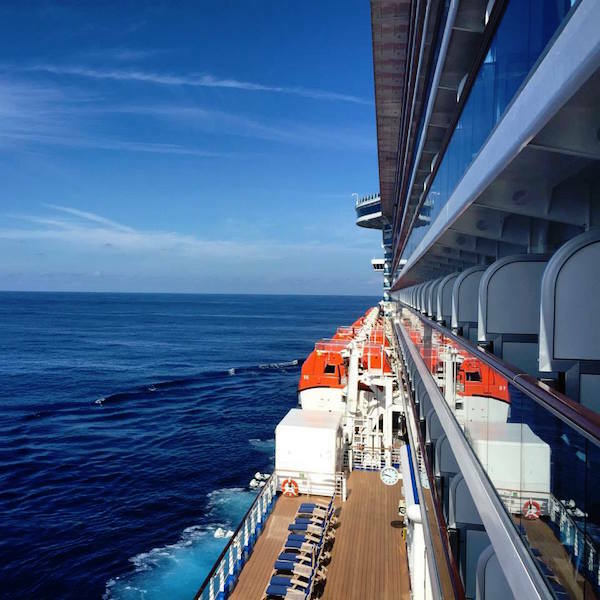 Most cruise lines will scan your sail card, or do a roll call to make sure you aren’t skipping out. If you intentionally don’t go or get caught skipping, the cruise line has the option to throw you off the ship for insubordination. When the room steward is knocking on your door the last morning of the cruise – it’s not because he’s trying to be mean – it’s because he needs to clean the room for the next guests. It’s pretty remarkable that the crew can flip a ship in three hours. The reason they are able to do that is by having you out of the room by 8 am on disembarkation morning.